These coffee shops but the "bar" in barista. 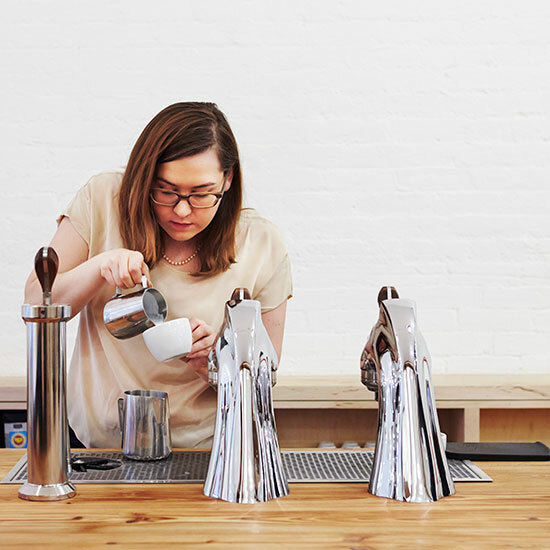 L.A.'s coffee scene has never been hotter. From G&B's stand at Grand Central Market to the newly permanent space of buzzy coffee pop-up House Roots, a new wave of cult caffeine purveyors is seeking inspiration from its cocktail counterparts. House Roots barista Jimmy Lee walks us through how he has raised the bar. Lee hired the architect turned barista behind L.A.'s Cognoscenti Coffee to design the 25-foot quartz counter. It mimics the sprawling one at hot spot Everson Royce Bar in the city's Art District. "Bartenders have all their toys in front of them but don't intrude on your space," Lee says. That's why he placed the La Marzocco espresso machine and two kegerators just below the counter, so they don't block customers' view. No squeaky furniture here: The same six homey bar stools from past pop-ups line the new space, so guests can settle in and stay a while. "We like having regulars, just like a bar," Lee says. "We're set up for people to hang out." The menu morphs to cater to an evening crowd. Lee reduces rum into a simple syrup for his chocolate "drunken" mocha, which he shakes with ice and strains to serve neat. Also on the menu: a flight of soda, iced tea and kombucha.